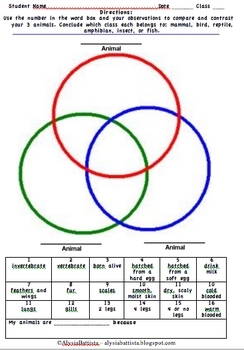 This is a free one-page animal classification triple venn diagram. The word box at the bottom is numbered so that students can easily compare three animals. Be sure to choose animals in the same class (such as 3 mammals or 3 fish) so that students understand how they are classified! Does not come with pictures to use - may be added later and you will be notified.